The University of Maryland, Baltimore (UMB) held a grand opening for its Community Engagement Center at the BioPark on Saturday, April 16, including a spring community festival to introduce the neighborhood to the center and its valuable services. The center is designed to extend into its surrounding West Baltimore community the services and expertise available at UMB and its seven professional schools. At the center, local residents have access to healthy living seminars, workforce services and a weekly organic market, as well as legal services such as guidance on expunging criminal records. “We see a great need in the community, particularly after the unrest that faced West Baltimore this time last year,” said Jay A. Perman, MD, UMB president. “As an anchor institution in Baltimore, we have the resources and expertise to help our neighbors, and our sense of community obliges us to make that possible. This Community Engagement Center enhances our existing ties to the community by creating a new space right in their own neighborhood where residents can access services that can help to make them healthier, happier and more successful. We have great hopes for this center and for this city, and we’re delighted to celebrate its grand opening with our wonderful neighbors.” Read more. Gov. Larry Hogan called the state’s life sciences industry the “backbone of Maryland’s economy” and said the state must do more to drive new business here. Hogan spoke at the close of the first day of the Regional BioTech Forum, a two-day event held at MedImmune’s Gaithersburg headquarters April 18 and 19. “Your success is our success, and as we look ahead it is absolutely vital to work together as a region to attract the best and brightest workforce, and attract a critical mass of companies,” Hogan said. Hogan touted the state’s ranking in the most recent jobs report from the U.S. Department of Labor. Maryland added 20,000 jobs in March, more than any other state that month. A few Baltimore companies got a shout-out during his remarks: Profectus BioSciences, which is working on an Ebola vaccine, WellDoc, which has an FDA-approved mobile app for diabetes management, and Emergent BioSolutions, which has two drug manufacturing facilities in the city. Read more via the Baltimore Business Journal. Paragon Bioservices, Inc., a global leader in the manufacturing of biopharmaceuticals and vaccines, announced that it was selected as the “Best Contract Manufacturing Organization” by the World Vaccine Congress, at its annual meeting held in Washington, DC recently. The Vaccine Industry Excellence (ViE) Awards honor the industry’s most outstanding achievements in vaccine development from all corners of the globe. The award in this category was based on consideration of the range of services provided in niche and core therapeutic areas, methods of performance improvement, attention to and quality of relationships with clients, reaching of milestones and outcomes, and building and maintaining long-term partnerships. Read more. Seven-month-old Quinn perched on Jay Perman's lap, pulling off the doctor's glasses and cooing. Perman sat at a table, surrounded by students from the University of Maryland, Baltimore's schools of medicine, social work, pharmacy and nursing. Amanda Mahle, a third-year medical student, ran down the baby girl's medical history: Almost from birth, she arched her back and screamed in pain after eating. No treatments have helped, including an acid reflux medicine and a nonallergenic formula that costs her parents $500 for a 12-can supply. It's a teaching moment for Perman, the university president. Read more via the Baltimore Sun. 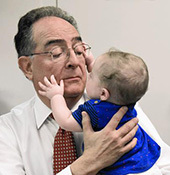 Dr. Jay Perman, president of University of Maryland, Baltimore, holds seven-month-old Quinn. Maryland Proton Treatment Center Featured on MPT's "Direct Connection"
On March 28, Dr. William F. Regine from the UM School of Medicine spotlighted the new Maryland Proton Treatment Center (“MPTC”) via Maryland Public Television's "Direct Connection" program. This center features five treatment rooms housed in an 110,000 square-foot facility on the BioPark campus. Lunch-and-learn with BioPark tenant Robert Crim, President & CEO. VAYA Pharma, Inc. The Tech Council of Maryland's annual Industry Awards Celebration recognizes the leaders and innovators in the technology and life science communities from Maryland and the surrounding regions. The evening brings over 900 technology, life science, government, academia, and supporting businesses together at one place, at one time for Maryland's best night of networking. Learn more. Presented by the Tech Council of Maryland, Bio+Tech16 reflects the changing landscape where life sciences and technology converge by bringing together more than 500 professionals in both fields so that they may meet and forge new partnerships that will lead to great new discoveries. Bio+Tech16 is the first event of its kind in the Mid-Atlantic region that brings together the life science and technology sectors to meet and leverage the talents of the other to grow their organizations and their industry. Learn more. Please join and network, connect and renew your entrepreneurial spirit mixing with the leadership of the university and the technology community that is the BioPark. Hope to see you then. Click here to register. 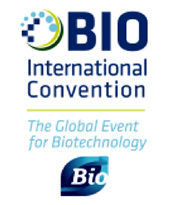 The BIO International Convention (BIO) attracts over 15,000 biotechnology and pharma leaders who come together for one week of intensive networking to discover new opportunities and promising partnerships. Learn more. Would you like to promote your technology or services at the international BIO conference? Logo Visibility: Scroll of organization logo on screens at front and back of Maryland Pavilion when stage is not in use. Video: Presentation of 1-4 minute video on screens at front and back of Maryland Pavilion when stage is not in use. Up to three videos/organization. Sound will be low or muted. Video should be engaged without sound. Literature Display: One 8.5" x 11" piece in literature rack. Contact Jaquay Smith for pricing and other details. Please send your news, milestones, events, and ideas to lcassard@umaryland.edu. Not subscribed to this eNewsletter? Subscribe now. For more information, please contact Linda Cassard.